Moves by the FFA to expand the A-League have a lot of fans buzzing about the future of football in this country. Many would be hard pressed to even recognise the game of 15 years ago. The NSL had poor crowds, a shambolic administration and a sectarian fan-base. The A-League has firmly placed the sport into the mainstream with broad base membership and corporate support. Bit by bit the league has increased corporate sponsorship, tv viewing and playing standards. From where it was to where it is now, football is clearly winning over Australia. In just ten years we have developed a league averaging over 10,000 fans and millions of dollars in revenue. Just imagine what we could do in 50 years. The drive for more fans and a second division will give more Australians a chance to be a part of the league. Compare this with the closed shop mentality of the other codes playing the same teams again an again with no punishment for failing. While other sports are pushing for millions of dollars to upgrade soulless mega stadiums, in football the discussion is returning to boutique stadiums that offer a more unique and intimate atmosphere. With fan engagement, home ends become a spectacle in themselves as they display the passion fans have for the game. The other ones? Let’s chuck on an INXS or a Metallica song and call it authentic. Don’t even get me started on playing numbers. North of one million people, the sport of football is looked upon with envy by the other codes desperate to sell the game across state lines. 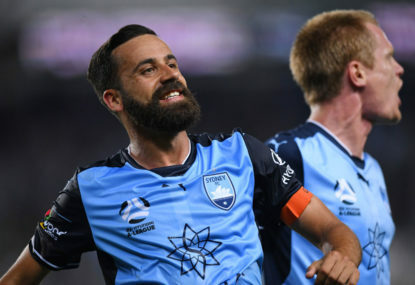 If the A-League can install a workable second division that unites all levels and can strike a deal with new media outlets, thus avoiding the dinosaur analogue channels, the dominance of football will be complete. For too long football has stayed quite and humble in the face of outsiders trying to stop its development. We can safely say those days are gone as it continues it slows march to number one.